The rain gods were gracious to us today. Though a little chilly, we had a dry day. A few hours in Petaluma browsing antique shops and we headed for Sonoma. Lunch was on the sidewalk at the Cheese Factory. 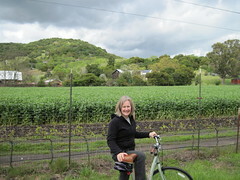 Esther enjoyed some window shopping before we explored the short bike path that skirts the hillside wineries behind town. We enjoyed the chance to get a little exercise and sunshine. In the evening we went to Sacramento to join Jack and Sue at Ellen’s for supper and then to witness Butler U's heroic effort in the final dance. Tomorrow Ellen is back to work while the Washingtonians head for the Monterey Peninsula and sunshine.